This article is based on a Media Release from Via Campesina. In the next few days, the multinationals Monsanto, DuPont and Dow are expecting a positive response from the Mexican Government to sow 2.4 million hectares of GM maize in Mexico, a surface area equivalent to that of El Salvador. The situation is extremely alarming since Mexico is the world’s centre of maize diversity, with thousands of varieties in the fields of peasant and indigenous communities. Maize is currently one of the world’s three main food staples, so the contamination of Mexican maize by dangerous GMOs is a threat to the entire planet. 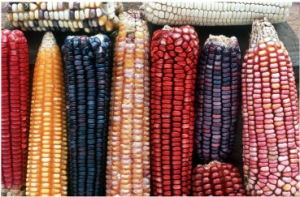 There are thousands of local varieties of maize in Mexico’s peasant communities, each one the product of different climates, soils, ecosystems and cultures. From Mexico, maize spread across the world, becoming one of the most important foodstuffs for many other peoples, especially in Southern Africa, Asia and all of Latin America. In recent decades, however, industry and the multinationals have also shown considerable interest in maize. They have developed hybrid varieties, dependent on pesticides and other inputs, which peasants must purchase. They have also developed GM maize varieties which today cover 51 million hectares across the globe. Studies published recently in France show that GM maize could seriously damage health. These risks have not been properly assessed. In the French studies, rats which ate this maize suffered high incidences of cancer, with damage to their vital organs. In Mexico they want to sow, among others, the same variety of GM maize as that in the French studies, known as “NK 603”. GM crops are, moreover, a violation of peasant rights. “All GM plants contaminate peasant crops, through genes patented by multinationals, and thus prevent peasants from using their own seeds. 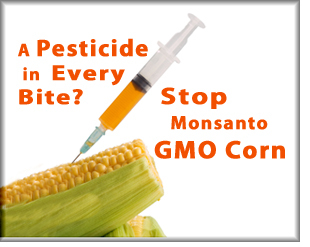 That is why in Europe we applied pressure to obtain laws which today ban GM plants from our fields and our food. In Europe and throughout the world we need to support the people of Mexico in their resistance to the multinationals. The wellbeing of everyone on the planet is at stake”, said Guy Kastler of Via Campesina France. Via Campesina calls upon its organizations to organize a major offensive and to remain alert. in the face of this offensive, we must mobilize in all countries: filing complaints at headquarters of the multinationals Monsanto, DuPont and Dow and with the governments that support them; filing complaints with bodies such as the FAO and the United Nations Convention on Biodiversity (CBD); pressuring Mexican embassies throughout the world; organizing demonstrations and other actions; disseminating the information through all possible media. The people and peasant communities of Mexico resist the multinationals. Reject this attack on life across the planet! NO TO GM MAIZE! KEEP MONSANTO OUT!